Whether you're dying to get a pair of leopard print booties in your closet or just can't get enough leopard this season, you're bound to be drawn to this beautiful piece of footwear. 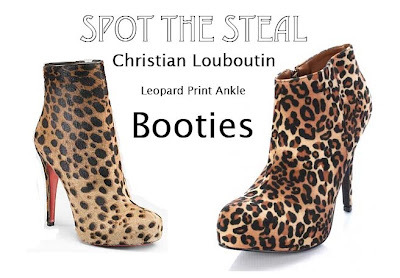 Christian Louboutin has wowed me again with these amazing mile high booties pricing at just about $2000. Eck! Luckily I happened to stumble upon these much cheaper alternatives from Urban Original. I love how Kim Kardashian wears hers with just about everything, well you'd have to just to justify spending $2000 on a pair of booties!